So I went for the lazy option and bought some ready made shortcrust pastry. You need to heat your oven at 180C. In a bowl whisk two eggs, two egg yolks (put the two egg whites in a bowl, this will be for the meringue), 150g of sugar, the zest of two lemons, the juice of two lemons and 200ml of crème fresh. Put the pastry in a tart tin, poke it a few times with a fork and put it in your heated oven for 10 minutes. Then remove and add in your lemon mix, leave the lemon tart in the oven for 30 minutes. A few minutes before your tart is cooked take your two egg whites and add two more egg whites, whisk until you can virtually tip the bowl upside down without the eggs falling on your head…then add 50g of sugar and whisk the eggs a bit more. Remove your tart from the oven and cover the surface with the egg whites. Turn the oven down to about 50C and put the tart back in for about 5 – 10 minutes. 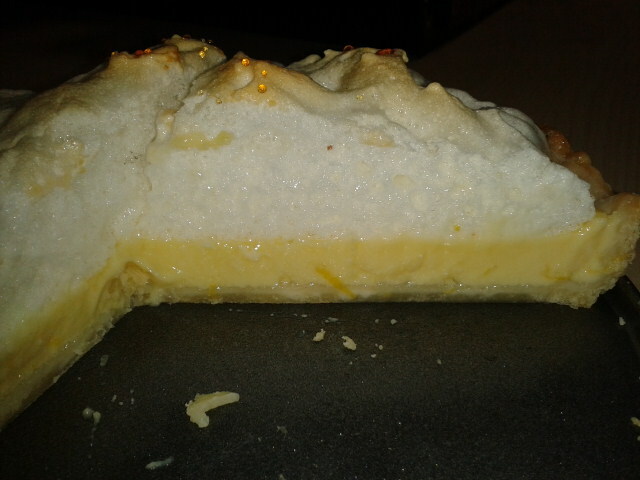 I would check on the tart after 5 minutes and as soon as parts of the meringue start to golden you know that it’s ready. Remove from the oven and let it cool. Everyone seemed to enjoy it this afternoon and it definitely satisfied my craving. I really don’t like lemon. Do you think I could do this with some other fruit? What do you suggest?? I think you could probably try quite a few different fruit instead of lemon. I think any kind of red fruit would work really well. Why don’t you give it a try and let us know how it goes? That sounds yummie! Oh, & nice blog!